Maine anti-wind book wins First Prize at the New England Book Festival. 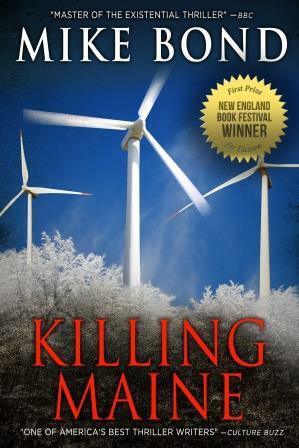 Killing Maine, by best-selling Maine author Mike Bond, has just won First Prize at the prestigious New England Book Festival. Killing Maine is set in the deeply corrupt Maine legislative process that has led to the takeover and destruction of Maine’s beautiful mountains by industrial wind companies. The book is already a New England and Maine best-seller, and the Festival Prize will expand its readership throughout the state and the entire US. Maine is already rated the second-most politically corrupt state in the US by the Gallup Poll (only Illinois is rated worse) and has been given an “F” for Political Corruption by the Center for Public Integrity. The infamous Expedited Wind Law instigated by governors Baldacci and King and backed by Maine Senator Justin Alfond and other legislators in return for payoffs from industrial wind companies is the background to Killing Maine. Although touted as “green”, industrial wind projects do not lower greenhouse gases or fossil fuel use, because wind is so erratic that fossil fuel power plants must work full time to back up wind projects. However, wind projects have enormous environmental impacts including destruction of property values, tourism, birds, bats and other wildlife, visual beauty, water quality, and all the many resources that make Maine the special place it always has been. Hundreds of Maine mountain tops have already been destroyed by wind turbines, and thousands more miles of Maine mountains are about to be destroyed. Fully complicit in this tragedy is the Spanish utility Iberdrola, owner of Central Maine Power, and the largest single recipient of federal corporate welfare funds. Iberdrola’s largest shareholder is the oil-rich nation of Qatar, which is also a major supporter and funder of ISIS and other Islamic terrorist groups. Killing Maine is available in most Maine libraries and bookstores, and online nationally at Amazon, Barnes & Noble and other book retailers. For more information on the industrial wind takeover of Maine, go to www.SavingMaine.com. I must confess, I leased my desert land to a wind farm. The result is noisy, mechanical, and as you say, destroys the beauty of a pristine ecology.